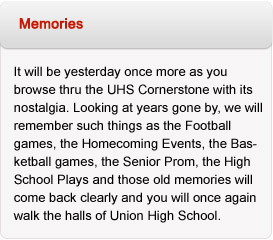 I graduated from Union High School in June 1970. Hard to believe that nearly 40 years have passed since the day I so innocently walked on the gym floor and onto the stage to receive my high school diploma. So many memories, some funny, some sad, but all contributed to make me the person I am today. Like the majority of the Union High students, I was a farm girl. Along with my six siblings, my parents, my maternal grandmother and occasionally my uncle, I lived on an operational dairy farm in Gates. (It was operational until 1967 when my parents sold the dairy cows but retained the farm.) Since hired labor was expensive and hard to find, the 7 of us were expected to help work the farm. The boys had it harder than the girls, but we still had to do our share. Each morning, two of us alternated with our mom to milk the cows. While the dairy herd was relatively small, 25-30 cows, it was still a chore that needed to be done before school. Mom would wake whichever one of us was scheduled to help, around 4:30-5:00 a.m. Oh, how I hated those mornings! I would wake up, sit over the floor register in the kitchen trying to get very warm, and drink a combination of coffee/milk (heavy on the milk) before I would get on my barn clothes and head out to get the cows. If the weather wasn’t severe (heavy snow or very cold temperatures) the cows slept at the bottom of the hill. I recall that it was pitch dark and even with a flashlight to guide me, I was still afraid. The cow dog, a black border collie, would go with me to help herd up the cows and when I saw his eyes I felt safer. I have no idea what I was afraid of but I just remember being afraid. Once the cows were in the barn lot we would start the milking. Each cow had a name and once she entered the stall, we would mark her off the list. Some of the cows were kickers and more than once, I got kicked. Granted, milking itself was automatic by that time, but it was still a responsibility needed to be done twice a day. The doors were automatic and the cows would come into the empty stall, they were fed, cleansed and milked. Most days we were through milking by 7 a.m. Also, the barn had to be cleaned, the manure scraped up into the manure pile, and everything had to be disassembled and cleaned for the afternoon milking. We never knew when the county inspector might visit so things had to be kept extremely hygienic in the barn. Once we were done with cleaning, I would rush home to get some breakfast, get cleaned up for school, and then ride the bus to school. Sometimes I would still be doing last minute homework on the way to school or studying for a test. My friends/classmates and I were extremely competive so I needed to be prepared. I always wanted to do well in school. My parents expected us to do well, encouraged us to do well, but at the same time expected us to contribute to the success of the farm. The responsibilities I was given at that time now don’t seem to be so great but at the time they sure did. I wouldn’t trade those days for anything – it truly was on-the-job training for a happy and successful life.